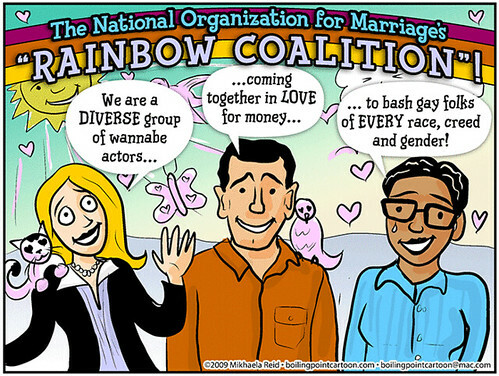 Boiling Point Blog: Feminist, LGBT and progressive political cartoons: The National Organization for Marriage’s “Rainbow Coalition”! The National Organization for Marriage’s “Rainbow Coalition”! Drew this after those ridiculous NOM ads first popped up on YouTube. The actual quote I'm referencing from NOM's ridiculous gay-bashing "Storm is Coming" ad: "But we have hope...a rainbow coalition of people of every creed and color are coming together in love to protect marriage."